These days people started buying Laptops more when compared it with desktop PC. It is always good to know about the laptop company which you’re going to purchase laptop. When buying laptop, people give much preference to laptop design, price tag and Quality. But what about Support? No one will take care about it and suffer in later days. Here is an Infographic about best customer support in India for servicing and anything happened after the purchase made. Similar: Problogger revealed his source of income! We all need to take care about supporting service in feature days after the purchase made by the laptop, because laptop aren’t the same has desktop PC. It is so delicate and we need to take special care about laptop as compared to desktop PC. So it is important to have a look at a customer support before the purchase of laptop. You may think all company provide warranty and so we can easily get service, but it is not as easy as we say. Even if they provide support, we need to satisfy with there support. In most case you may not satisfy with their support facility. Here, one of the most popular tech blog called Techtree conducted a Poll regarding the best support provider for the laptop in India. In this poll there are thousand of Indian people voted their favorite laptop company regarding the support how they provided to their customers. 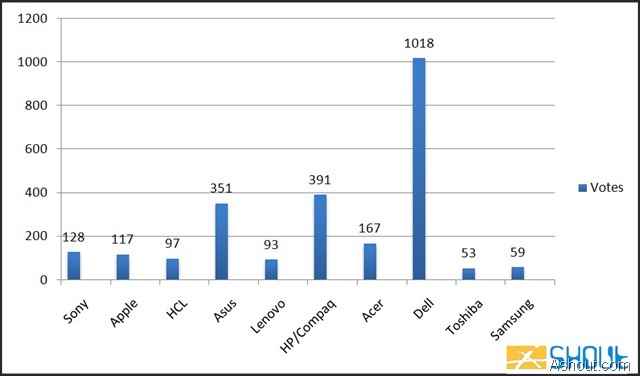 In this poll all Indian major laptop company names are listed they are, Sony, Apple, HCL, Asus, Lenovo, HP/Compaq, Acer, Dell, Toshiba and Samsung. This poll has not yet completed, but most of the people voted for Dell company. 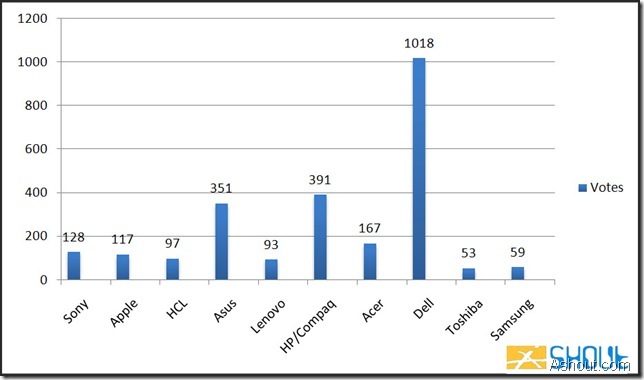 Nearly 40% of the people voted for the Dell company has the best service provider for the laptop in India. I’m personally experienced with the Dell service, one of my friend Dell laptop has got some trouble on that time he just called Dell customer Service center. After lodging compliant about laptop, the employers came to my friend home and repaired their laptop without taking any fee, even the transportation charge. And other company service I don’t have any personal experience with it. You need to understand their service with this poll itself. One thing you need to note is, this poll is not the final and it may not be accurate also because in India people use Dell laptop more compared to the other companies. So, the Dell company is having more customers, it helps them to get first. You can vote on this poll and you can see the discuss about the laptop companies here. Know the companies before buying any product. HP is also good company as for as I know. I have two laptops.One is from HP and other is from Compaq.Thanks for sharing. you been doing great in your business i do hope that someday im one of your partner in busines. Me and my brother both are using dell laptop only. Dell offers very good support after sales. I’m not aware of apple support after sales. If are ok with apple, then feel free to go with apple itself. It comes with best hardware. For your information my dell laptop speaker won’t work properly and I heard from my friends as well. my plan to purchase I3 gen 5 lap top but i am confuse, my purspose is normal. use MS office and watch movies through HDMI to TV. could you suggest which Laptop i have purchase ? i3 is ok for whatever the purpose you have mentioned but also keep in mind, once you bought you cannot easily change the configuration of laptop. So before buying laptop think one more time. If your budget allows go for i5 only. I am planning for an Acer Laptop. Is it possible for you to confirm the after sales service in Mumbai/Navi Mumbai region. I have been through a few blogs & websites and it is mentioned that in a few regions service is good whereas in a few areas, the service is not up-to the mark as there had been delays, unanswered calls/mails. Hi.. it will be difficult to show best laptop under 25K, as each user have different requirements. I recommend have a look on online shopping site and look for good rating products. DELL SERVICES IS VERY BAD…DELL SOLD DEFECTIVE LAPTOP IN COUSTMARS…PLZZ DO NOT TRUST DELL…..DELL REPLCE FALUTY LAPTOP PARTS IN MY SYSTEAM….DELL NOT REPLACE THE FAULTY SYSTEAM…HE GIVING ME REFABRISH PIC..WEST MY 6 MONTH FOR REPARING….TECNICIAN VIST MY HOME 25 TIMES…SERVICE IS VERY BAD..NO LIFE DELL LAPTOPS AFTER YOUR WARRENTY IS OVER….SPECCILAYY DO NOT BUY VASTRO SYSTEAM…..THANKS N BE CAREFULL FOR CHOSSING DELL….! Dell compani is Sold me defective pic…..he changes some parts they are also problematic….vastro syteam is very bad i face charing problem 2 times.my friend faceing same problem..dell replce my mother bord they are also faulty..technician visit my home 25 times…my 6 months warrenty also west for part replcement…plzz do not bye vastro system..aftear one month use many isuuse faund in my lapi….dell not change this deftive pis….they are aslo west my time in part replcment….aftear your warrenty is over dell vastro latop no life(chala to sham tak nahi to chand tak )…..be cAREFULl for bye Vastro Systeam….service is very excelllent but not TRUSTEBAl….!! Thanks for sharing your experience, Aditya. I personally aware of dell vastro is having issues with the laptop.